Interestingly, The Period Shop launched on a day known for its taboos and superstitions—Friday, May 13—at 138 Fifth Avenue in New York and stayed open through Sunday evening. All proceeds from merchandise in The Period Shop benefited Susan’s Place, a NYC-based transitional residence for homeless women. In addition to hosting live events, celebrity appearances, and tons of sweet freebies like manicures at The Period Shop over the weekend, Kotex also hosted a temporary online shop and a Twitter sweepstakes to bring more fans into the experience. The Period Shop is part of a larger initiative by Kotex called “The Period Projects,” which aim to change the way people perceive, talk about, and shop for products to improve that time of the month. So, what can you learn from this bold initiative? Your customers are your biggest asset. Deeply understanding who they are and what they’re looking for as it relates to your company is the foundation for creating remarkable experiences. As seen with Kotex, being present, listening, and capturing insights can also spark amazing new levels of creativity that propel your business forward. 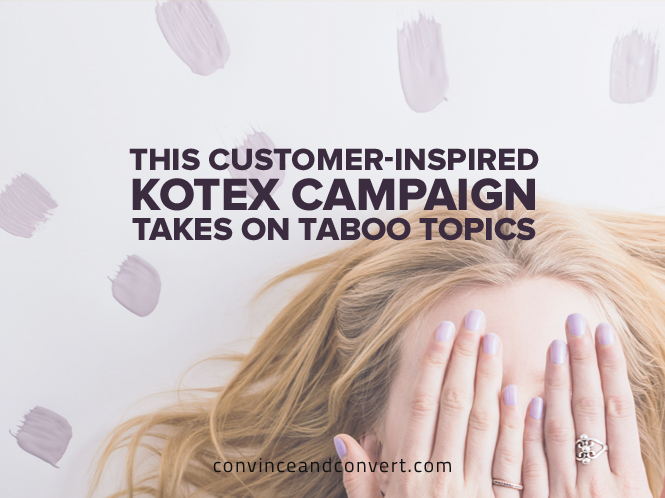 An inspiring part of this campaign is how the customer with a vision, Sarah M., is front and center, partnering with Kotex to encourage women to be more open in talking about their periods. From videos to interviews on The Period Shop website, Sarah, a student at The Fashion Institute of Technology, is getting the ultimate experience here seeing her idea come to life. Part of delivering remarkable customer experiences is understanding when to connect consumers around a common cause, vision, or passion point. Events foster natural connections, but so do online communities, such as the ones from Weight Watchers and Dell, where consumers are united around common interests. The end result? Higher levels of engagement, advocacy, and ultimately, brand loyalty.